Outlander brings an end to season 3 by closing off the Jamaica arc and setting up a new location for the next season. Like so many things this season the Jamaica arc has felt very rushed. The reintroduction of Geillis last week and the reveal that she is manipulating pretty much everyone she meets in one way or another could have provided enough material to chew on over the course of several episodes. Claire’s history with Geillis and Lotte Verbeek’s engaging presence are more than enough to establish a capable foil for Claire who is on equal footing in some respects and eclipses her in others. Geillis is a woman of considerable influence and her objective was made clear last week. She plans to play a major part in a prophecy focused on putting a Scottish monarch on the throne. Last week it was established that it would happen after the death of a child 200 years old on the day of its birth. I slightly misunderstood the prophecy when I interpreted it last week and said that the child has to die on the day of its birth though the valid interpretation judging by this episode is that the child can die any time as long as it was 200 years old when it was born. My idea involved the child being present at their own birth and dying the same day but that doesn’t seem to be the case here. I stand by my interpretation in some ways as the wording is vague enough to have multiple readings. The current working theory is that Bree is the subject of the prophecy which Geillis learns from a conversation with Claire. It’s the best scene of the episode as it shows how devious Geillis is. Claire is effectively powerless at this point as she has been brought into Geillis house and is only alive because Geillis allows her to be. 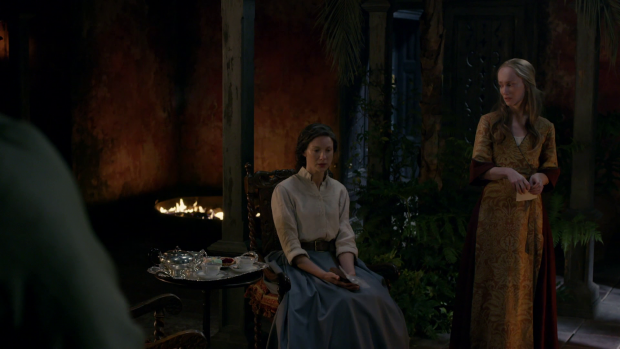 Geillis accuses Claire of spending the last 25 years trying to ruin her plans which can’t be the case since Claire spent the bulk of that time in the 20th century. Naturally this is met with scepticism until Geillis shows Claire photographs of her and Bree. Claire revealing that information makes sense as she is trying to keep herself alive but it ends up doing more harm than good once Geillis becomes convinced that Bree is the answer to the prophecy and focuses her efforts on travelling to the future in order to kill her. To do this she needs to make use of a time portal which is handily available in their current location but she has no real idea how to activate it. She believes that the blood of an innocent needs to be sacrificed to make it work and let her travel through time but Claire knows that this isn’t necessary since none of the three times she used the stones required this. She doesn’t know for sure how to make it happen either but thinks that it has something to do with something calling to her from the other side. There’s an undercurrent of destiny at play here that has existed since the beginning. My thinking is that Claire has been playing out what she is “supposed” to do the entire time. She couldn’t prevent Culloden because it had to happen, she went back to her own time because she had to do and returned to her current time period because it was “meant to be”. The fact that the dead woman in the cave mentioned in “Freedom and Whiskey” turns out to be Geillis supports the theory that history plays out as it always has and the characters play their part in it. It could be argued that this removes all agency from the characters since they are only playing their part in events as they have always happened but I’d disagree with that. None of the characters know what they’re supposed to do so they still make choices based on how they want to proceed. Geillis wants to change history so puts every resource she has into doing so for example. The fact that she can’t do it is because Claire makes the choice to stop her which allows the events to play out as recorded. Neither side know their place in history or even that they can’t change it so they still make choices based on the available information and hope for the best. The reveal that the skeleton actually belongs to Geillis is played as a shock for Claire as she realises that she is responsible for what Joe was showing to her. In theory should convince her that she can’t change history though if she becomes part of events she knows nothing about then any desire to make changes becomes moot. This show’s approach to time travel is interesting so I’d like to see this explored by the characters next season. Unfortunately the interesting storytelling largely ends after Claire and Geillis conversation where Geillis manoeuvrers her way into gaining the upper hand through information. It isn’t bad from that point on but it feels largely mechanical with things happening without allowing any time to explore the emotional impact. Basically the episode feels like it’s in a rush to close off the season 3 plot lines so that it can start setting up season 4 which makes for some pretty limp storytelling as it simply feels like things are happening because they need to happen rather than characters making choices based on experience or emotion. A good example of this is Archibald’s death, So little attention is paid to it that the shock value is completely lost. Mr. Willoughby declaring his love for Margaret and revealing that he is in a relationship with her is less of a shocking reveal and more of a confusing one. So many questions are brought up as a result of this such as how they met, how much time they’ve really spent together and whether Mary is mentally stable enough to knowingly enter into a relationship with someone. You also have to wonder when Mr. Willoughby would have had time to actually see her considering how controlling Archibald is. As far as I’m concerned his love for her only exists to present a reason for Mr. Willoughby to come to his defence and remove Archibald from the equation. Another moment that lacks the emotional impact it should is Claire’s discovery of the connection between where she is and Craigh Na Doon. 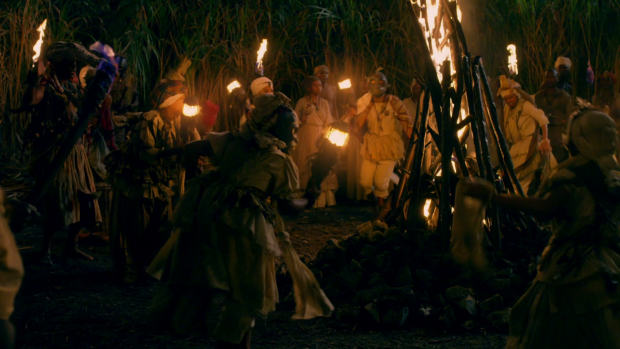 A flashback to the very first episode solidifies the similarities but there were a number of visual callbacks such as the ritual dance looking similar and Claire hiding in the grass nearby observing it. The difference here is that the depiction in the first episode was slow and haunting where is very quick and cast aside to move the plot forward. 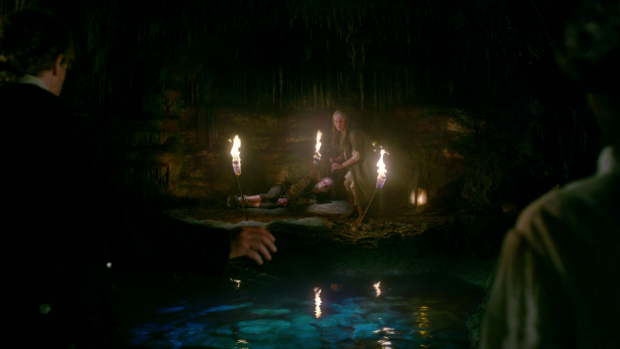 From here we get to the confrontation in the cave which does have a great deal of tension thanks to talented actors making the scene work but as a conclusion to the very short Geillis arc this season it doesn’t really measure up. It’s clear that this showdown was supposed to be an epic sequence showing Claire gain the upper hand against an adversary from a similar background who had been one step ahead before now. Claire’s decision to nearly decapitate her felt largely incidental rather than necessary. If Brie’s life had been kept at the centre of the conflict and Claire had made the conscious decision to brutally kill Geillis to save her daughter then there would have been far more impact. The foundations were established by Margaret channelling Brie shortly before the conflict. It’s a shame that Geillis has been lost to the show without having a proper send-off. As a character she had so much potential than was explored and her exit was lacking if brutal. Much of her nuance was removed to make her the clear villain in the final confrontation rather than presenting her case as a necessary one from her perspective. Perhaps if more time was given to properly explore these ideas then things would have turned out better. Coincidence based plotting makes an expected appearance in this episode as well. Jamie’s arrest is quickly cast aside despite being something that has been hanging over the show for quite some time now. David Berry does a great job in the scene playing Lord John dressing down Captain -actually Lieutenant- Leonard for stepping outside his jurisdiction. It might completely brush aside something that was supposed to be a big deal but at least it was entertaining when doing so. 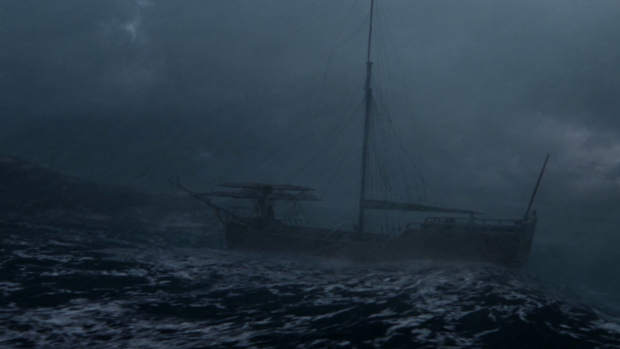 The setup for season 4 happens when Claire and Jamie return to the Artemis and set sail for Scotland only to be stopped by a hurricane that tears the ship apart and throws Claire overboard. Before this happens we are treated to a really passionate moment between Claire and Jamie where they talk about their desire to return home and the audience is invited to drink in their shared chemistry. As always their relationship comes across well and this particular interaction is a reminder of how committed they are to one another. This scene is what gives the episode its title as it happens to be the only quiet moment in the surrounding chaos. It’s also a capable reminder of their relationship just before they risk losing one another. The Artemis being torn apart is the destruction of the relative safety of the moment and the beginning of something new. It’s a great sequence with excellent visual effects. The storm is huge and terrifying against the relatively small and fragile Artemis and the breaking apart of the ship is incredibly slow which greatly adds to the tension. Teasing the destruction by having the pieces of the ship slowly break away shows how inevitable the loss of hope is for the crew. Claire being pulled down by a piece of the ship trapping her in rope is a really striking image complete with her narration detailing the hallucinations she experiences as she approaches death. The sail is mistaken for the wings of Angels for example which is a very poetic image and having Jamie swim down to save her is a very satisfying moment. 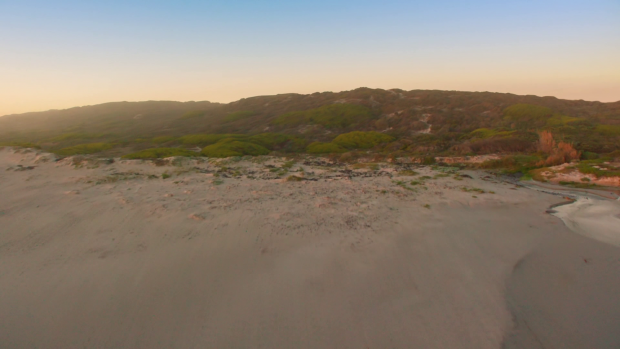 The ending of the episode where they wash up in Georgia confirms the setting for at least the early part of the next season bringing with it a sense of wonder and mystery as to what awaits them in the New World. Of course they continue to be the luckiest people in existence after surviving yet another disaster but that’s par for the course at this point. An uneven episode that had some great moments as well as an overall rushed quality to the storytelling. The early scene between Claire and Geillis was really well done showing the clear antagonistic relationship and the ability of Geillis to manipulate people into supporting her goals. After this the plotting feels somewhat mechanical which undercuts the final confrontation and makes Geillis’ exit from the show feel somewhat underwhelming. Once the Artemis sets sail for Scotland, Jamie and Claire have a really sincere, passionate and loving moment establishing how committed they are and bringing them to maximum closeness before risking them being torn apart. The hurricane sequence was excellently done with excellent visuals and the slow destruction of the Artemis ramping up the tension. Ending the season with Claire and Jamie in America ready for the next adventure is an intriguing prospect. Those of you following my reviews of this season will know that I’ve been unimpressed with it on several key points. I still enjoy the show and like the characters but the entirety of it has felt rushed. Early episodes burned through years of content so that the reunion of Claire and Jamie could happen as quickly as possible. With it being the show’s key relationship it’s reasonable for the writers to want to get out of them being apart as quickly as possible but in this case it was at the expense of so much potential. On balance Jamie’s side of the story was handled better though it was equally rushed as the writers were accelerating through the 20 years they spent apart but there was more of a sense of the relationships he was building, the things he was doing and what ultimately led him to where he ended up before Claire returned. Claire’s part of the story was very clumsily handled. Her treatment of Frank was unfair especially considering how much work went into making the character sympathetic, there was no sense of her relationship with Bree since she appeared briefly through the years if at all and major developments in her life such as becoming a Doctor were rushed to the point that they might as well have been summarised in dialogue. Given the popularity of the show spending an entire season building up to the reunion should have been possible and would have left breathing room for the interesting developments that barely got a mention to be explored. Once Claire and Jamie are back together things get better but a lot of the same problems exist. It was great having the characters interact once again but there was a lot of manufactured angst caused by the withholding of information that was less than interesting and things moved a little too quickly but the core relationship was always strong and once things settled down into being more character driven rather than plot driven there was a lot of strong material. The seafaring episodes were the strongest for that reason but what came after that was also rushed. Devoting an entire season to the post reunion plot would have been a better approach. As for next season I hope to see things return to a more character driven focus. America presents a lot of varied opportunities for different storytelling and I’d like to see that explored more gradually with a focus on the characters driving the story rather than the story driving the characters. I have no idea how the books approach this next chapter which is for the best as far as I’m concerned as I can go into the season with my eyes open ready to be surprised. If you want to chat to me directly then I’m on Twitter as well. Join me back here for more Arrow reviews in January. So ends the first act of Outlander. In my own opinion, the next three books (seasons) make up the next act. These are large books. Read any two of them and you have read more, by word count, than what is in War and Peace. As far as I can tell, the production will continue to keep a single book within the confines of a single thirteen episode season. I will say that Drums of Autumn is more character driven than Voyager. I agree that 313 felt a bit rushed. That is one reason I was not a big fan of the amount of time spent with Survivor Claire in 311. One small note about the prophecy. The show prophecy is different than the book prophecy,but both prophecies point to Bree. Additionally, book readers don’t learn about the prophecy until after book 3 (I am being deliberately vague here).